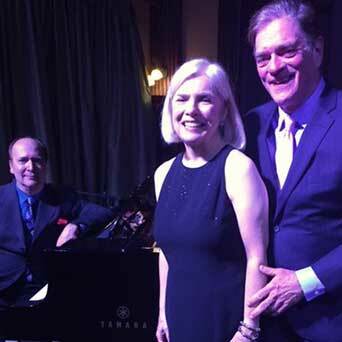 Maureen Kelley Stewart, Tom Stewart & Don Rebic present an overview of the works of legendary 20th Century American composer Jule Styne from his distinguished career writing for Hollywood films, Broadway theater and his hugely popular Great American Songbook hits. He wrote hit songs for Frank Sinatra, Carol Channing, Ethel Merman, Doris Day,Judy Holliday, Barbra Streisand, and Jimmy Durante among many other stars. Tickets are now available. Jule Styne was the composer of eight Academy Award-nominated songs for the movies, including “It’s Magic,” “I Don’t Want to Walk Without You,” “Time After Time” and “Three Coins in the Fountain.” He, of course, composed the music and songs for Broadway mega-hit shows including: Gypsy, Funny Girl, Bells are Ringing, Gentlemen Prefer Blondes and many others. Maureen Kelley Stewart is a cabaret artist, actress and winner of the prestigious Manhattan Association of Cabarets & Club’s (MAC) Hanson Award, launching her cabaret career in 1993. Since that time, Maureen has performed a number of tributes to iconic Great American Songbook composers and lyricists in many New York City legendary cabaret rooms, including the Laurie Beechman Theatre, The Metropolitan Room, Eighty-Eights, Don’t Tell Mama, Judy’s Chelsea, Danny’s Skylight Room, Helen’s Hideaway and others. Maureen made her debut at New York’s Town Hall for the Mabel Mercer Foundation. She is a graduate of Iowa’s Clarke University, San Francisco’s American Conservatory Theater and a fellow of the Eugene O’Neill Center Cabaret Symposium. Originally from Chicago, Maureen lives in Brooklyn Heights with husband Tom Stewart of New York’s PBS media station Thirteen/WNET. Maureen’s CD, “Seventeen on Mars,” is available at CDBaby.com. Visit her at MaureenKelleyStewart.com and on YouTube. Tom Stewart is a native of Amsterdam, New York, attended Brown University and is a graduate of the New York’s famed Neighborhood Playhouse School of the Theater, where he studied with Sanford Meisner and William Esper. Some of Tom’s favorite theater roles have included Henry in Tom Stoppard’s The Real Thing at the Pittsburgh Public Theatre; Richie in David Rabe’s Streamers for the New York Shakespeare Festival at Lincoln Center; and Ned in Phillip Barry’s Holiday for the New Phoenix Repertory Company on Broadway. In addition to many other regional theatre productions, he was featured on television in the PBS series, The Adams Chronicles, as well as ABC Theater’s F. Scott Fitzgerald and the Last of the Belles. Tom’s professional life is focused at Thirteen/WNET in New York, the PBS flagship station, where he serves as the staff announcer (“the Voice of Thirteen”) and on-camera TV personality.